Facing a huge cut in power allocation which has led to power cuts, the Chandigarh Administration today shot letters to the Union Power Minister and also the Union Power Secretary demanding more power for the city which is reeling from huge cuts to tide over the shortage. IT park sans environmental clearance! Gurdwara or parking place for trucks? Caretakers of Gurdwara Tibba Sahib, Sector 26, are allegedly charging Rs 50 per truck as a parking fee illegally and give a receipt of donation (kar seva) against the money charged by them. The PGI’s Deputy Director Administration (DDA) Meeta Rajivlochan was not allowed to join her duties today at the institute when she came back after remaining on “forced leave” for the last 15 days. 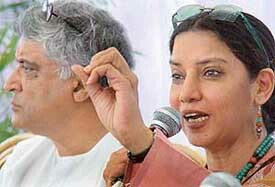 When Shabaan Azmi and Javed Akhtar get together it is perhaps theatre at its best. The unstated intensity, the silken bonds between two strong individuals and the dialogue that flows between them yield valuable nuggets on their state of being. 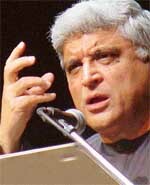 Javed Akhtar enraptures with his words. Measured, motivated and refreshingly melodic, they flow unmindful of restraint, inspiring emotions and actions alike. And as they impact the mind at various levels, one wonders what has kept Javed Akhtar from entering politics. “I have never felt the need to be a politician. Par logon ko bigadte der nahi lagti,” shot the poet in Javed Akhtar who stood in conversation with the people of Chandigarh at Tagore Theatre, courtesy Reel Entertainment. After holding eight Faridabad-based lawyers and a journalist guilty of contempt of court, a Division Bench of the Punjab and Haryana High Court has sentenced them to undergo simple imprisonment for periods ranging from three to six months. A fine ranging from Rs 1,000 to Rs 2,000 has also been imposed. The Armed Forces Special Powers Act has only made security forces brutal and has exposed the ugly face of the Indian ruling elite. The Director, State Transport, Punjab today ordered an inquiry into the alleged callousness of a bus conductor in Morinda that had led to a student sustaining grave injuries. The bus conductor had reportedly pushed out the student from the moving bus. The student, Jatinder Singh Honey, a BA first year student of the local Government College, fell on the road and the rear tyre of the bus crossed over his right leg. The person who had mooted the idea of the possibility of the revival of Punjab Wireless Limited here has been booted out of the process. In a controversial move the Punjab Government has ‘once again’ constituted a core committee to revive Punwire, this time, excluding the name of Kharar MLA Bir Devinder Singh from the committee. Nearly 90 per cent of women are engaged in agriculture and allied activities, but only 1 per cent have land in their name. This is indeed a sad reflection, said fiery feminist Shabana Azmi, while exhorting rural women in the region to become more active and assert their rights. A number of special programmes are scheduled to be organised to mark the 57th Raising Day of the Western Command at Chandi Mandir Military Station, near here, from September 15. The Federation of Indian Schools (FIS), as a NGO comprising members from different walks of life, have announced a movement against terrorism beginning from Gandhi Bhavan, Panjab University on October 2. Auto-rickshaw drivers in the township intensified their ongoing stir today. Autos coming from Chandigarh were stopped by the striking drivers and not allowed to enter Mohali, leading to angry scenes at the Mohali-Chandigarh border points. Sources said the striking drivers deflated tyres of some autos coming from Chandigarh. Mrs Swatanter Kaur, chairperson, Himveer Wives Welfare Association (HWWA), inaugurated a housing complex of 15 No Type-III quarters here today. This would benefit a long-standing requirement of ITBP troops, deployed on the border outposts on the Indo-China border. As an annual feature to check the effectiveness of its emergency preparedness in case of any mishap, Bharat Petroleum Corporation Limited (BPCL) conducted a mock fire-fighting drill within the premises of the company’s bottling plant here today. 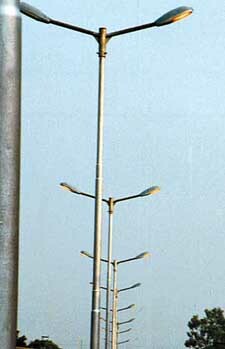 A High drama was witnessed at the Sector 9-10 dividing road near Matka Chowk late this night when about a dozen motorists alleged harassment by UT police personnel who had put a naka there to nab the traffic rules violators, including drunken driving. The counsel for the Deputy Commissioner and the Municipal Council president has sought time till September 18 for filing a reply in a petition filed by two lawyers on the pitiable condition of public conveniences in the courts complex. A five-day conference on ‘Media, Technology and spirituality’ is being organised jointly by the media wing of Rajyoga Education and Research Foundation and Brahma Kumaris at Shantivan from September 26. Mr M.P.S. Chawla was elected President of the Chandigarh Industrial Association at a meeting of the association in Industrial Area Phase II here today. A scooterist, Raju Singh, resident of Vallapur village, Amritsar district, was killed when vehicle hit him, near Parveen Gas Agency, Mullanpur road, Sarangpur, yesterday. He died on the spot. The police has registered a case. A seminar on Business Excellence Through Process Approach was organised by Rotary Club Mohali today. Mr B.B. Gupta of Underwriters Laboratories was the key speaker. 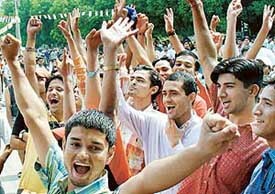 Continuing with their agitation against the decision of the Chandigarh Administration to hold indirect elections to the Students Council in the local colleges, different student bodies organised rallies and disrupted classes in various colleges. A growing demand for 3D animation specialists is making it a good career option for the youth, said Mr Abhishek More, Director, Operations, of the Pune-based Digikore Studios Limited in an interaction with mediapesons here yesterday. 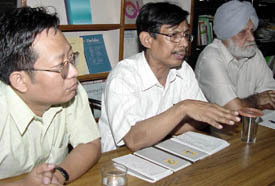 As many as 705 cases were disposed of while a sum of Rs 21. 09 lakh was awarded as compensation to litigants in various cases during a Lok Adalat organised at the District Courts premises today. As many as 1,670 cases were put up in this Lok Adalat. The Abhishek Ahluwalia case will come up before the district courts on October 9 as the statements of the victim’s mother Ms Anuradha Ahluwalia and of Abhishek were not listed. SALMAN Khan is quite a convincing actor, especially when he is romancing. But he needs to look more realistic when he is grieving for his doctor wife, played by pretty Preity Zinta who is killed in mishap. Anyway, a pampered Salman and fresh-looking Preity do bring the bonding alive. The formula hinges on the heart of the doctor, who before dying, literally gives it to her patient played by Bhoomika Chawla. Now Bhoomika can’t be anything but a captive of her heart. Little wonder then that she in love with the widower instantaneously. But his only mission in life is to realise a dream project of his late wife. Add to it Bhoomika, who crawls out of woodwork to prove the adage “human beings die but love lives on”. CHANDIGARH: Hollywood makes them big. And often pathetic. Those sci-fi ventures with skinny plots and flabby special effects. With a plethora of gadgets and futuristic limousines, ‘‘I, Robot’’ (Kiran, Fun Republic) is the latest addition to that burgeoning chain of absurdities. The year is 2035 and the place is Chicago where robots are used as domestic helpers. 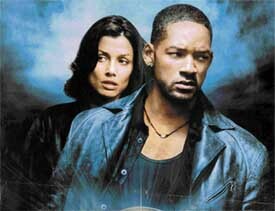 Bridget Moynahan and Will Smith in “I, Robot”. The National Theatre Festival by the Haryana Public Relations and Cultural Affairs Department promises a literal feast this time around. 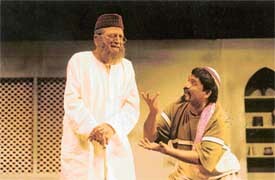 Starting at Tagore Theatre from September 13, the festival will feature some of the finest theatre productions ever created. The choice of plays is varied and purposeful. Very few foreigners has taken “kathak” with passion and devotion as Isabelle Anna. A French national she spreads myriad splendur of kathak with graceful ease. “The dance form is my language and through it I can express myself,” she said in an interview. Her cultural foundation was laid 30 years ago when her parents opened an Indian cultural centre, Mandapa, in Paris to promote Indian arts in France. Dance is in her blood. Her mother is also a dancer. To create awareness about the increasing risk of cardiovascular diseases among the city population, the PGI and UT Health Department have decided to join hands in starting the Cardiovascular Diseases Control Project. Diksha today claimed the under 10 girls singles title but she had to toil hard in overcoming the spirited challenge of Shreya in three games on the penultimate day of the 16th Chandigarh State Badminton Championship being played here at Sector 42 Badminton hall. In other matches of the day, mens singles semi-finals witnessed a tough tie played between Pawan Malik and Vikas Kundu which former won in three games. The under-13 girls singles’ semi-final played between Nisha and Gunjan also proved to be a thriller before former could win in three games. The Chandigarh Cricket Association (CCA) affiliated to the Haryana Cricket Association (HCA) has decided to host a Ranji Trophy match this season. This was decided at the Executive Committee meeting of the association held here last evening. DAV College, Sector 10, Chandigarh in men’s section and GGS College for Women, Sector 26, won their respective matches with ease in the Panjab University Inter College Table Tennis played here at PU Gymnasium. The inaugural SJOBA Golf Tournament will be held at Panchkula Golf Course on Sunday. The lush green fairways and perfectly manicured greens on the right bank of the Ghaggar will be the site of the tournament.